MB-100/MB-100S Deployment Configurations - NexSens Technology Inc. This section contains only general information on the available mooring options. To develop an effective mooring strategy, a variety of application-specific criteria must be thoroughly reviewed prior to deployment. Adverse weather conditions, water level fluctuations, currents and wave action, debris loads, and other factors can cause entanglement of mooring lines, submersion of the buoy, and damage to sensors and other components. NexSens does not endorse any particular mooring strategy for any application unless the end user performs a thorough review of the site conditions with the NexSens engineering team. The MB-100 and MB-100S data buoy supports 1-point moorings only, so the sensor mooring line will also function as the line used for buoy mooring. If using an SDL500 data logger, lay it out on a flat surface. Secure the connected sensors to the sensor mooring line using sensor clamps and plastic cable ties. Note that the sensor mooring line should be shorter than the approximate depth of the water column. A bottom chain can be used to allow for fluctuations in the water level. Connect the sensor mooring line to the mooring eye on the MB-100 or MB-100S data buoy using a 1/2” bow shackle. 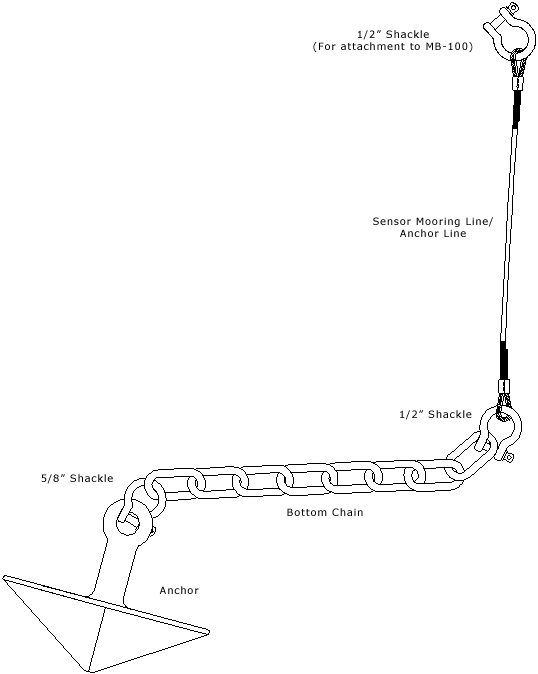 Connect the anchor and bottom chain with a 5/8” shackle, and then attach the assembly to the sensor mooring line using a 1/2” shackle.